This week, NBC2 in Terre Haute, Indiana, broadcast a strong two-part story by investigative reporter Patrick Fazio about the Illinois Eavesdropping Act and the Annabel Melongo case, arguably the most extreme application of the controversial statute. Cook County State's Attorney Anita Alvarez -- whose office's six-year prosecution of Melongo resulted in a July article by the Reporters Committee for Freedom of the Press -- refused to be interviewed. Click here to view Part I on NBC2's website. As NBC 2 has investigated for the past year and a half, citizens have faced felony charges for recording audio of law enforcement. Now we've found an Illinois woman who's actually spent time behind bars because of the state's eavesdropping law. Annabel Melongo was arrested and jailed for more than a year and a half for recording her conversations with an on-duty law enforcement official. For the first time ever, Melongo is talking about being locked up for recording possible government corruption. The first segment also reported that the eavesdropping case grew out of previous charges filed against Melongo in 2006 for allegedly destroying computer files of the Save-A-Life Foundation (SALF). A politically-connected Chicago nonprofit that reportedly obtained almost $9 million in federal and state funds, SALF has since been the subject of dozens of media exposes and has been under investigation by the Illinois Attorney General since 2010. Click here to view Part II of Fazio's report which tags Anita Alvarez for selective enforcement of Illinois law. The high-profile Cook County State's Attorney is apparently camera-shy about the Melongo case. She refused to be interviewed. To date, no Chicago mainstream media outlet has reported about the Melongo case. 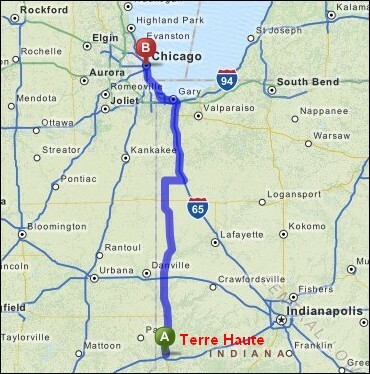 According to Mapquest, Terre Haute's about 200 miles south of the Second City. Lucky for those interested in her case, Patrick Fazio and his NBC2 crew were willing to make the drive.